Description: the Velociraptor stands in a stalking posture, its right arm and leg stretched outward and its head raised upwards with its mouth open, as if it means to jump on something. The tail is raised upwards and bent at the tip. All of this creature's body is coloured orange, except for its underside (lower jaw, throat, belly, most of the lower part of the tail, underside of the arms and fingers and inner parts of the legs and feet) which is beige instead. A large part of the face around the eyes on either side of the Raptor's head is also beige. On its back, the Raptor features six yellowish beige (a different shade of beige than mentioned before) stripes, with smaller yellow stripes of the same shape in the centre of each of these stripes. The figure has yellow eye sockets, housing cat like orange eyes with black pupils. It has white teeth and a red inside of the mouth, as well as black claws on the feet (but not on the fingers). A white JP logo is found on each upper leg. The Spinosaurus is positioned in a crouching move, its right arm resting on the ground, possibly stalking potential prey. Its left arm is raised upwards and its mouth is opened wide. It's a very green figure, this colour being found on all of the body, except for its underside (lower jaw, throat, belly, most of the lower part of the tail, inner parts of the arms and legs) which is coloured dark beige. The upper jaw and face, the feet and the sail are coloured dark green with the tip of the tail and three stripes running around the tail full circle sporting the same colour. On both flanks it carries a few beige spots. The figure has small yellow eyes with black pupils. It also has white teeth and a red inside of the mouth and tongue. The claws on both hands and feet are not painted. A white JP logo is found on each upper leg. 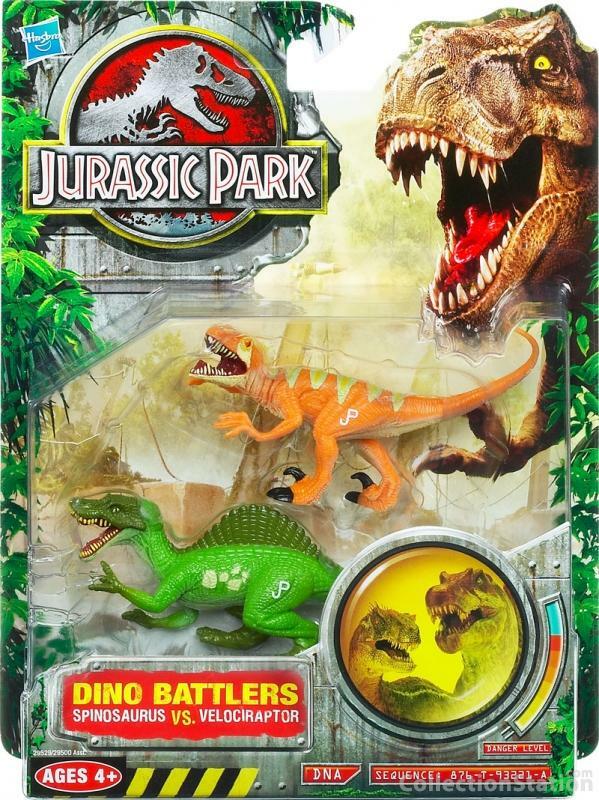 Analysis: Hasbro yet again went for a very colourful set of new paint jobs in this two-pack, but again failed to deliver on making these paint jobs look actually good, except maybe for kids who like their dinosaurs overly brightly coloured. Both paint schemes are otherwise not very inspired. In fact, the Spinosaurus' paint job is very similar to the green paint job of its Camo-Xtreme Swamp predecessor, making it a poor copy of that particular release. Both figures lack a sense of detailing, as illustrated by the lack of painted claws (except for those on the Raptor's feet, but in this case the small claws on the back of the feet have been neglected). It is good to see the alternative Spinosaurus sculpt used for a change (though of course a new sculpt would have made us much happier! ), since we haven't seen it since JPD2. The same can't be said for this Raptor sculpt, which has overstayed its welcome for far too long. The Raptor, which in normal circumstances would be more or less in perfect scale with Hasbro's human figures (though not in the standard JP situation where Velociraptors are hugely oversized), is lucky he's about equal size as the Spinosaurus. In reality any Spinosaurus would just bite the Raptor in half, being considerably taller. In a fight between these particular two dinosaurs, the Raptor with its lethal sickle shaped claws would probably win the day. The Spinosaurus already seems to have fallen to its knees accordingly. Repaint: yes. The Spinosaurus originally came with the Military Diver for the JP III line (Wave 2) and has been repainted before a few times for Camo-Xtreme and JPD2 and would be used twice for this toy line. The Velociraptor sculpt was paired with Alan Grant for the JP III line (Wave 1 instead) and has been repainted many times for Camo-Xtreme, JPD2 and JPD3 and would also be featured in various JP 2009 sets. Overall rating: 3/10. Funky use of colours here, but these new paint schemes aren't particularly imaginative or appealing. Besides, there's just nothing of particular interest in this set, unless you don't own either one of these sculpts yet. This set is not rare and can still be found with little effort. Since this two-pack was a Toys'R'Us exclusive that could change some day, but probably not for the next few years.